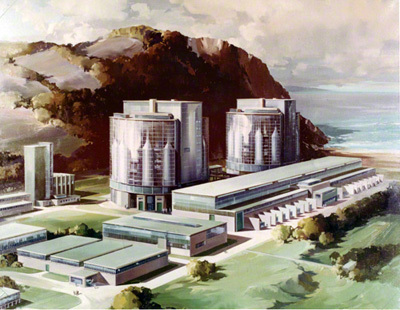 Claude Buckle’s commission to paint in oils Scotland’s first atomic power plant shows how industrial scenes can be shown very successfully. This is a typical style of the artist and which uses strong architectural representation and was very likely painted before construction of the plant began in 1957. The picture is an oil painting. This picture is from a photograph supplied by the GEC group of companies. 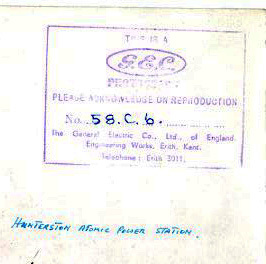 The painting hung in the manager’s office (Geoge Mears) for much of the working life of Hunterston A. Former station manager’s secretary Hope Grant remembers the painting well. After Geoge Meers retired painting was left in the office. Number of possibilities of where the painting is now.